Back Home for Our 20th Anniversary Festival! After one year away, Central New Jersey's number one festival is returning home. "We are happy to be back at our home," said an excited John Scarpati, founder and president of the festival. "We have worked with the Mercer County Park Commission over many years to get the festival grounds to where they are today. We are thrilled to be, once again, working with the Park Commission to bring our great festival to the citizens of Mercer County." Peruse our Italian Market and purchase Italian and Italian-American handcrafted products from numerous vendors. Enjoy more than twenty amusement rides for the whole family, provided by Majestic Midways. Entertainment takes place on the Investors Bank Stage and includes national and international favorites, Italian folk dancers, big band music, traditional Italian music, Italian American favorites, opera, and children’s entertainment. Past performers have included The Duprees, Michael Amante, Southside Johnny and The Poor Fools, Johnny Maestro and the Brooklyn Bridge, Sam Butera and the Wildest, The Happenings, Floyd Vivino, and Joey Dee & the Starliters. Click here for this year's schedule. Peruse over 60 offerings in our Italian Market and purchase Italian and Italian-American handcrafted products from numerous vendors. View memorabilia with over 200 displays of important and famous Italian-Americans who have made a contribution to our Country. Check out more Italian products, crafts and organizations. Bocce is back. Have fun enjoying Italy's number one game. There will be tournaments, bocce lessons, and time for everyone to play. Listen to guest speakers and watch cooking demonstrations. Located in the Italian Heritage Pavilion in front of the beautiful tapestry of Venice. Join us on Saturday and stay for the festival's spectacular fireworks display. The winning ticket number for the 2018 Super 50/50 was 18772. The total collected was $18,498.00 with the winner receiving $9,249.00. Thank you to everyone who purchased a ticket and congratulations to the winner! Special thanks to New Jersey Assemblyman, Wayne DeAngelo, who sponsors the printing of our 50/50 tickets. For more information, please call our chair, Marion Bolton, at 609-396-2944. And make sure to get on our mailing list for 2019 - Big Winnings for a Small Investment! Bella macchina! Enjoy our display of antique, classic and modern Italian cars, motorcycles and scooters, and cast your ballot for the People's Choice award. If you have an Italian car that you'd like to display, we'd love to have you! Start Sunday with Mass at 11:00 am on the festival grounds at the Investors Bank Stage. Go to our Directions Page for the best way to get to the festival - Click here. The Mercer County Italian American Festival is a presentation of the Mercer County Italian American Festival Association, a 501(c)(3) non-profit organization. 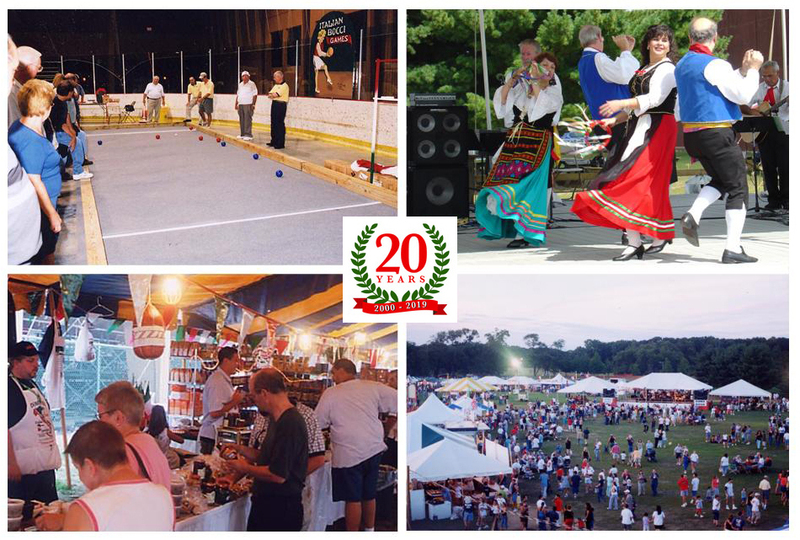 The Mercer County Italian American Festival invites you to share your story of growing up Italian (or with Italian friends). We all have stories that our grandparents or parents passed down to us or that we lived ourselves that, when shared, create a common bond among all of us. So tell us your story in 250 words or less and include a photo related to the story. Selected stories and photos are published on the festival website. Click here to read stories! The 2018 winning ticket number for the Super 50/50 is 18772. The total collected was $18,498.00 with the winner receiving $9,249.00. Congratulations to the winner and thank you to everyone who purchased a ticket! Click here to learn about an easy and no cost way to support the festival - the Investors Bank Care2Share program. Like our facebook page to see the latest news on the festival! Hamilton Township has named Newkirk Avenue, at the corner of Liberty Street, Scarpati's Way, in honor of John's work in promoting Italian culture in Hamilton Township and Mercer County. Become a member of the Mercer County Italian American Festival Association! Click here to download an application to become a member of one of the best Italian-American organizations in New Jersey!